Combining biology and other realms of science with mystery and imagination. 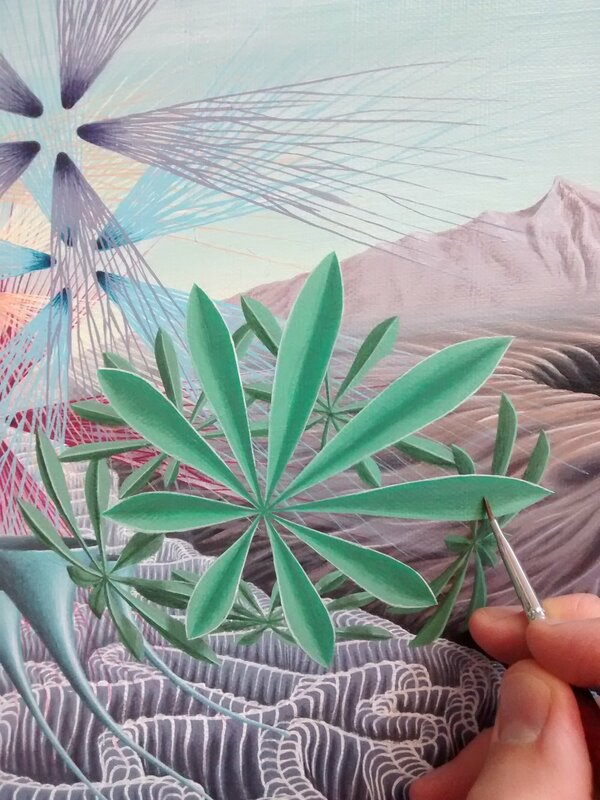 Working on some details such as floating lupine leaves and slightly deconstructed orchid flower. My clients for this commission live in Colorado so many of the elements of this painting are based on the local scenery and flora. Another new component to the piece is the yellow glacier lily at the top left (inspired by, anyway). A few more elements to go but its getting there! Sign up for my email list to receive occasional updates. My focus is to explore the next level of human advancement through nature-inspired surreal paintings. It is human-nature to be curious, to learn, and to evolve. This evolution materializes into new ideas, discoveries, and technology. But where do the ideas come from, and what are they leading to? I believe they begin with an inspiration from nature. The inspiration facilitates our imagination which leads to new ideas, and new ideas lead to solving a problem. This is why my paintings are a blend of unique, inspiring elements of nature and imagination. I paint the relationships of the known with the unknown, conscious with subconscious, and real with surreal. In doing so, I hope to reveal to others the hidden wonders of nature and unleash their inspiring power. We may seem separate from nature at times, but we are just another part of it. We can, however, continue to grow and progress while keeping this in mind. More specifically, I use elements of nature that typically go unseen and are lesser known. They are unusual, mysterious, and most importantly, inspiring. They are often microscopic such as single-cell radiolarians, the facets of a bee's eye, or our anatomy right down to the cellular level and beyond. They are the subjects of biology and science that are still on the edge of exploration, from the neurons in our brains to the fabric of the universe. They appear surreal, but are in fact real. Mixed with the imaginative, surreal elements of the painting it makes us question what is real and what is not?